Lindsey Haun. Jack Huston. Max Kasch. Maya Hazen. Alice Greczyn. Don Wycherley. Sean Mcginley. Horror. Drugs Related. Madness and Mental Illness. Murder Mystery. Teen. Violence. Stoner Flicks. When five American students arrive in Ireland to go on a camping trip, with their old buddy Jake, they are in high spirits. Jake has promised them the �trip of a lifetime' because he claims Ireland has the best magic mushrooms in the world. 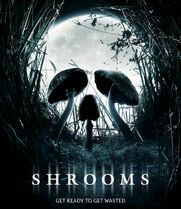 Fed mind-altering fungi and spooky campfire stories about the sadistic Black Brother, whose ghost roams the woods, the kids are soon off their faces and up to their necks in gore.